Citation Information: J Clin Invest. 2011;121(9):3542-3553. https://doi.org/10.1172/JCI58183. Mutations in myocilin (MYOC) are the most common genetic cause of primary open angle glaucoma (POAG), but the mechanisms underlying MYOC-associated glaucoma are not fully understood. Here, we report the development of a transgenic mouse model of POAG caused by the Y437H MYOC mutation; the mice are referred to herein as Tg-MYOCY437H mice. Analysis of adult Tg-MYOCY437H mice, which we showed express human MYOC containing the Y437H mutation within relevant eye tissues, revealed that they display glaucoma phenotypes (i.e., elevated intraocular pressure [IOP], retinal ganglion cell death, and axonal degeneration) closely resembling those seen in patients with POAG caused by the Y437H MYOC mutation. Mutant myocilin was not secreted into the aqueous humor but accumulated in the ER of the trabecular meshwork (TM), thereby inducing ER stress in the TM of Tg-MYOCY437H mice. Furthermore, chronic and persistent ER stress was found to be associated with TM cell death and elevation of IOP in Tg-MYOCY437H mice. Reduction of ER stress with a chemical chaperone, phenylbutyric acid (PBA), prevented glaucoma phenotypes in Tg-MYOCY437H mice by promoting the secretion of mutant myocilin in the aqueous humor and by decreasing intracellular accumulation of myocilin in the ER, thus preventing TM cell death. These results demonstrate that ER stress is linked to the pathogenesis of POAG and may be a target for treatment in human patients. Increased transgene expression in TM of Tg-MYOCY437H mice. Transgene (Y437H MYOC) and WT MYOC expression were examined in 6-month-old WT and Tg-MYOCY437H littermates by (A) RT-PCR, (B) Western blot analysis, and (C) immunostaining. PCR products were sequenced to confirm the presence of the transgene. Transgene and WT MYOC were expressed only in the iridocorneal angle and sclera of Tg-MYOCY437H mice but were absent in the retina of WT and Tg-MYOCY437H mice (n = 3). MYOC protein levels were increased in angle and sclera of Tg-­MYOCY437H mice compared with WT littermates. 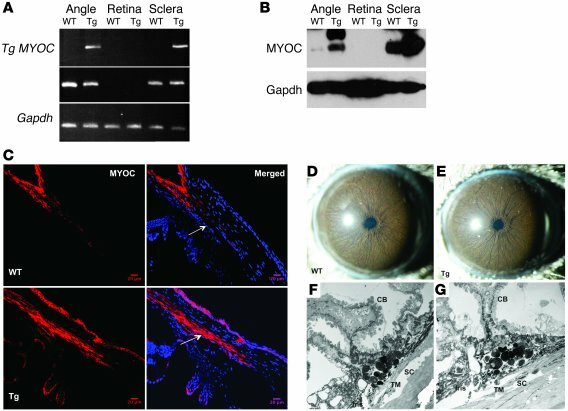 Note that MYOC protein was absent in retinal lysates in Tg-MYOCY437H and WT mice (n = 3). GAPDH was used as a loading control. Immunostaining revealed that MYOC was localized to TM and is increased in Tg-MYOCY437H mice (bottom panels) compared with WT littermates (top panels). The TM is shown by the arrow. Scale bars: 20 μm. Open iridocorneal angle and normal morphology of anterior chamber structures in Tg-MYOCY437H mice (D–G). Slit lamp examination of anterior chambers of 6-month-old (D) WT mice and (E) Tg-MYOCY437H mice reveal no abnormalities in the iris, cornea, and lens. TEM images of the iridocorneal angle of 12-month-old (F) Tg-­MYOCY437H mice were compared with (G) WT littermates. The iridocorneal angle is open in Tg-MYOCY437H mice (n = 6) compared with WT littermates (n = 5). Iris, ciliary body (CB), TM, and Schlemm canal (SC) are shown.